Up from $2,000 given to the winners last year, the champion team in 2014 will get $4,000, with the second place â $1,500; third place â $700 and fourth place â $300. Apart from the increased prize monies, each Man of the Match will receive a bat, compliments Veiraâs Courtesy Sports. The competition bowled off last weekend at the Arnos Vale One and Sion Hill Playing Fields. On Saturday, LIME Radcliffe and Victors One meet at Arnos Vale One Playing Field, with the winner meeting Ishallz Physical Therapy on Sunday at Sion Hill. 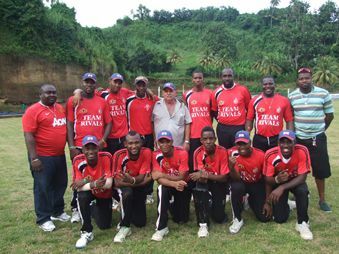 Also on Sunday, inaugural winners Team Rivals square off with Guardian General Saints at Arnos Vale One. Then, on Saturday, September 20 at Park Hill, the loser of the Rivals versus Saints encounter meets the loser of the match set for the Sion Hill Playing Field. The grand finale is carded for the Park Hill venue on Sunday 21, when the winner of Rivals/Saints match up the winner of the Sion Hill fixtured match. A release from the SVGCA stated that Ishallz Physical Therapy is allowed to draft four players into their squad, while the other four premier division outfits have a quota of two. The local cricket association has indicated that two West Indies international players will be featured in the final.